Modeling tools, eg. rolling pin, cookie cutters etc. 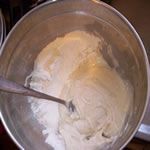 Gradually add warm water and mix well until you have a soft, pliable dough. 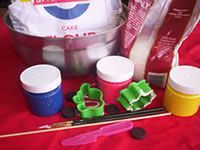 This will be our modelling clay, and is safe and non-toxic for children. 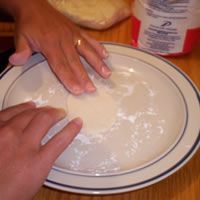 When you start working with the dough and find it is too sticky, rub flour on your hands and knead the dough a little. Keep the dough in an air tight container when you are not using it. Use a rolling pin to roll out the dough to about 5mm thick. 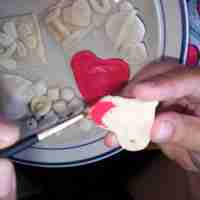 Use a cookie cutter to cut out the heart shape, or use your hands to mould it. 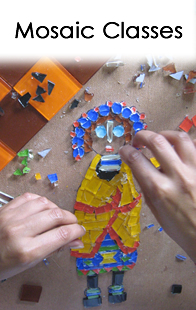 Gently turn the shape over and dampen the area where the magnet is going to be placed. Place your magnet onto the shape and press it gently to make sure it is stuck. Turn it back over. 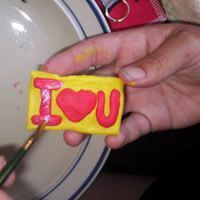 If you are making the I love you magnet (ideal for Valentine's Day), use a knife to cut out a rectangle once you have inserted the magnet. Then roll small pieces of dough for the letters. Wet the dough with some water and apply it to the rectangle. Lay a piece of tin foil on a baking tray and sprinkle it with flour. Place your shapes onto the baking tray, making sure they do not touch. Bake at 180˚C for at least 35 minutes. Remove from oven and leave to cool down for at least two hours. The drying process is part of the hardening process and you should leave it to cool down properly and not try to speed up the process. You can now paint your magnets with a water based paint. Remember, you can mix the colours you need from the three primary colours. When you are done painting the colours, leave to dry and then apply at least one coat of modge podge or varnish to protect it.